Diving in the Philippines is possible all year round. Water temperatures are always warm at 27 to 31 oC. The hottest months are April, May and June with temperatures over 32 oC. Christmas, Chinese New Year and Easter are particularly busy. The best time to dive the Philippines is probably between December and April. The wind changes from NE to SW for the monsoon season of June, July, August and September and this opens up some places that are not so accessible for diving in the drier months. It is also quieter at this time. Diving highlights include the World Heritage site of Tubbataha, thresher sharks at Malapascua, big pelagics at Panagatan and the wrecks of Coron and Subic Bay. It is currently not safe to travel to the South of the Philippines - namely Mindanao and the Sulu archipelago - because of terrorist activity and clashes between the military and insurgent groups. The majority of visits to the rest of the country are trouble-free, but it is wise to have comprehensive Diving Insurance. Climate: Dry from November to May, Wet from June to September. Average daily temperature 28-32 C, cooler from December to February. Best Time to Dive: Year Round, but water clearest during March to May. When the Southwest Monsoon is strongest from June to August, head for Puerto Galera. Water Temp: 26-27 C from December to March and 28-29 C during the rest of the year. Visibility : Anilao, Puert Galera and Verde Island: Between 20 to 40 metres. Subic Bay : 5-15 m.
"Anilao, Batangas is an easy 2 hour drive from Manila and has a large number of diving-dedicated resorts. Favorite divesites in the area include Cathedral Rock, a pinnacle that rises from the bottom at 120 ft to 45 ft., hundreds of Damselfishes and Sergeant Majors envelop the divers as they approach. The pinnacle itself is covered with crinoids and anemones with resident clownfishes. Bahura and Beatrice Rock close to Sombrero island are reefs covered with both hard and soft coral. Schools of red tooth triggerfish and thousands of orange anthias gather along the drop- offs while Moorish Idols, wrasses and white eyed morays play hide and seek among the table coral. Sepok wall is a short drift with the bottom at only 30m. With a current usually present, the divespot has the lushest soft corals in the area and the wall itself harbors large egg and tiger cowries. Bazura, is for the muck diving enthusiast and underwater photographers. A close, careful inspection of the brown gravelly bottom reveal seahorses, panda clownfish, banded pipefish, harlequin and robust ghost pipefishes, dwarf lionfishes, scarlet snake eels and even the amazing and engaging wonderpus! Ditto for Twin Rocks. Expect to see black, blue and yellow ribbon eels, rabbit and surgeon fishes as well as 3 different kinds of angelfishes, gobies and jawfishes. See if you can spot the 2 resident soccerball sized black frogfishes. " "Among my dives THIS is really the best! So many stone fishes around there anywhere you look there's a lot more. In this dive site is where I saw the prehistoric frogfish! You might also see sharks together with the current. If you would like to go here you should be there early about 7-8am. You wouldn't recognize that you are going deeper since it's in slanting formation. So beautiful that you would really come back and you will feel in love in it and you will start to shout "MAINIT!" This dive site is really addictive. So colourful marine world! You would see all those long fishes wandering around. Those sword, trumpet and flute fishes are just passing by you. Tunnel and cave-like formation." "Birthplace of SCUBA diving in the Philippines ... lots of macro stuff." "Diving here is great specially when it's already the safety stop. Our safety stop here is fantastic because there's a valley like coral formation there and only one diver can pass through it. There are alot of small species good for underwater photography. Colorful corals and lots of colorful, small fishes swimming around you. Current here is unpredictable and sometimes strong, but it's worth it. Sharks can be seen around if the current is strong. Lots of moray eels. Mainit Point and Beatrice are both really fantastic. " We've an article on diving Puerto Galera and other comments on our Diving Puerto Galera page. "Puerto Galera has varied species and truly one-of-a-kind underwater setting. Home to several rare species. " See also the Diving Puerto Galera page. "World class diving , the Best and biggest coral gardens with huge shoals of colourful fishes. " "The best corals I have ever seen. " "COLOUR, beyond a rainbow. Diverse, expansive. " "Verde Island is a haven of nudibranchs, frog fish and scorpion fish. During colder months in December nudibranchs mating can be seen. Recently some divers found approximately 450 mm long nudibranchs at 28m depth with eggs close by. Electric Clams, Sea Horses and Blue Ring Octopus can be found at close by. " "Verde Island is another great place for current diving but also nice in slack tides as well. A large variety of marine diversity and usually great visibility. " "Verde island, Puerto Galera Philippines is defenetely one of my best dive site ever!!! The most per square meters I've ever seen! " One of several wrecks in the area and is home to a photogenic school of batfish, yellow snappers, maroon frogfish, rabbitfish and Angelfish. "Nice, easy wreck - sometimes busy. " "A small wreck dive for beginners. Great Nudis in this area. " "Amazing! Right after we went to the sandy areas and did some muck diving - lots of nudibranchs, seahorses, and other small critters! I dove this site multiple times!" "I did this site multiple times. Current ranged from high to just minor. Not for new scuba divers who aren't good swimmers! " Subic Bay lies north of Manila, once an US Naval base, the restricted bay was opened to recreational divers in 1992. There are several wrecks at diveable depths with the battleship USS New York being the most visited. Overgrown with corals, and despite the usually murky visibility, one gets a sense of history as the twin barrels of its giant guns loom out of the depths as you descend. Spanish era gun boats as well as Vietnam era jet fighters are among the historical wrecks that can be visited by both recreational as well as technical divers. "I would say Subic Bay offers very diverse diving. Lots of fun wrecks to dive on suitable for beginners and advanced divers. Each wreck requires multiple dives. Visibility varies and can be fairly low at times, having said that this is definitely a place you want to visit in case you're interested in wreck diving combined with history. " "26 nautical miles off the western coast of Mindoro lies Apo Reef. Part of the National Integrated Protected Area system, this 27,469 hectare atoll is known as a mini-Tubbataha . Apo-mayor or big Apo is surrounded by a pristine reef of hard corals swarming with anthias, fusiliers, surgeonfish and other Technicolor reef fishes. The northeastern side of the island is where divers descend the vertiginous walls to look for the elusive hammerhead sharks. Apo -Menor has its own share of large residents in the form of manta rays and schools of bumphead parrotfish "
"Located in Sablayan, Occ. 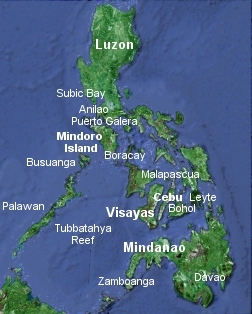 Mindoro. Has very beautiful corals and fish. Not crowded and well protected area. Very reasonable price both accommodation and hotel. Visit Feliz del Mar for overnight stay." Centrally located and with thousand of islands to choose from, this part of the Philippines contains the most number of diving destinations, with new finds being added every so often. Best Time to dive: Literally, year round since typhoons rarely come through the area. Water is clearest between March and May. Climate: Average Daily Temp 28-32 C , cooler from December to February. Water Temp: 26-27 C from Dec. to March and 28-29 C during the rest of the year. Visibility: Between 15- 40 mtrs. Apo Island comprises a protected coral reef surrounding a volcanic island in the Visayan Sea, Negos Oriental province. Negros Oriental lies south of Manila. The flight from Manila to Dumaguete takes about an hour. From the airport in Dumaguete it is about 45 minutes drive (25 km) along the coast to Malatapay. Apo Island is a further 30 minute banca (a motorized outrigger boat) ride from Malatapay, the "mainland" (what does that mean in a country which is a collection of islands?) of Negros Island. "Dauin/Apo Island, only 20 min from the Dumaguete City Airport is one of the easiest places to reach from Manila or Cebu City. The coastline on the southeastern side of the province of Negros Oriental is host to many dive centers and resorts. The beach of Dauin itself is fast gaining popularity as a muck diving site where photographers can find Blue-finned Lionfish, dragonets, several species of octopus (including the famous mimic), bobtail squid, snake eels, ghost pipefishes, cockatoo waspfish and sea horses. Several areas have been declared marine reserves and, for a small fee, allow divers to explore their protected reefs. Masaplod Sanctuary has a sloping reef of intact hard corals. It was delightful to see so many varieties of juvenile fishes in residence while Apo Island, the area's most popular divesite, is where the bigger pelagics such as immense schools of jacks, humphead wrasses and several colonies of clownfishes can be found. The local officials had implemented an strict No-Gloves-while -Diving policy a few years back and despite the heavy number of divers that visit the island, unbroken fields of both soft and hard coral still cover the reefs that surround this small island. " "The diving is excellent with a selection of walls dropping away from a convenient 5 m or so to 25 m and deeper. Highlights of the diving include: turtles, drifting through shoals of several hundred large jacks, myriad (tons, lots, even more than you are thinking of) clownfish among the anemones of "Clownfish City" in the fish sanctuary, fields of grass eels, lots of coral in good condition, and many more tropical fish than I shall ever remember the names." "Great corals!!! !- both hard and amazing soft ones. BIG schools of fish. Lots of turtles. Also a lot of big fish. Mainly driftdives. This small island is a divers paradise!!!" "Large turtles, schools of jacks, great coral and some drift and wall dive areas"
" To dive Busuanga WWII Japanese fleet check out Sangat Island reserve with fast dive boats and laid back living. Just booked my third trip for next April. "Divers go to Busuanga for 3 reasons, wrecks, wrecks and more wrecks. In Sept.1944 the American fleet sank 24 Japanese Imperial Navy vessels in the waters surrounding the numerous islands between Busuanga and Culion Island, 12 are diveable. Diveable year round due to the sheltered locations, all the wrecks are intact , extremely photogenic and overgrown with hard and soft corals. The Olympia Maru has huge white tube sponges, anemones and black coral. It is a favorite for photographers because of better lighting since it's portside is only 12 meters from the surface. The deeper Akitsushima meanwhile, is for more advanced divers. With a good guide, this wreck is easily penetrated. The remains of the coral encrusted crane lies outside. Divers will enjoy inspecting the outside of the 185 meter long Taiei Maru. Sitting almost upright, divers can swim through walkways which are festooned with Orange Black Coral trees while the main deck is covered with soft and hard corals. Shoals of yellow snappers are present throughout. In all of the wrecks, expect to find lion and scorpionfishes, fusiliers and batfishes. Lurking underneath and in the twisted metal remains are large groupers. Competing for a diver's attention is the topside beauty of the land which is simply breathtaking. Limestone Island topped with dark green vegetaion rise out of an turquoise sea. There is also a freshwater lake called Cayangan which can be reached after a short climb. Although it doesn't contain much fishlife, the clarity of the water reveals impressive underwater formations and a thermocline where the hot water from a spring mingles with the cooler water on top. " "For the people who like wrecks, this is the site...many wrecks of the Second World War..it was a stunning experience." "Coron is my favorite diving site with best beaches and diving experience." " An amazing tanker sunk by the Americans in WW2, this wreck dive is carried out almost completely as a long penetration and you seldom come out until you finish the dive. I've been on this wreck time and again and it never fails to thrill me." " Irako shipwreck, Coron, Philippines - Huge wreck in good condition. Max depth 43 m. Good penetration, lots of tunas, groupers and jacks. Some turtles and rays too. " " Intense prop shaft penetration in Coron Bay, Philippines with Jojo from Sangat Island. Refrigeration Vessel of the Imperial Japanese Navy. " Akitsushima is the ancient name for Japan. This seaplane tender was in use during the second world war from 1942 to 1944.
" The only divable WWII Japanese Sea Plane tender. Engine room, Ammunition elevator, AA Guns and Huge Crane. " The largest of the Coron wrecks. Strong currents so the chance to see loads of fish.
" WWII Oil Tanker of the Japanese Navy. Massive dark spaces, loads of marine life, Prop Shaft! " A UNESCO World Heritage site, Tubbataha Reef Marine Park is in the middle of the Sulu Sea. It has a very high density of marine species. The site comprises pristine coral reef with perpendicular walls, extensive lagoons and two coral atolls. It is reached by liveaboard from March to June (the nearest inhabited islands are 128 km away). Sea temperatures are from 25-27 oC. Currents can be very strong. Liveaboards visit Tubbataha from Manila and Cebu City. Find a liveaboard deal. "Great visbility, great biodiveristy, healthy corals and marine life." "This is the oldest Marine park in Asia with excellent marine life." "Almost in the middle of the large body of water that separates the island of Palawan from the rest of the Visayan Islands lies the Tubbataha Marine Park. Hands down, this is the best diving the Philippines has to offer. Marine biologists believe that this area is a major nursery for the underwater inhabitants of the Philippine waters. So important is this Sanctuary that it was declared a world heritage site by the UNESCO. "Only diveable between the months of March to early June. Mostly wall drift dives. Lots of pelagics such as tunas, schools of jacks, baracudas, whale sharks and reef sharks, hammerhead and grey reefs. Manta and eagle rays, turtles and reef is very colourful. " "Lots of Pellagics, schools of hammerheads, barracudas, mantas and a whole lot more ... Great Vis! " " Breathtakingly beautiful with an array of different corals and sea creatures which some can only be found there." It's distance from any large body of land means no runoffs of silt so visibility can be in excess of 50 meters. The fact that the diving season here, done exclusively from liveaboards, is only during the dry months from March to early June also contribute to the clarity of the water. Several small islands and their surrounding reefs make up this marine Park. North Tubbataha and South Tubbataha have rich sloping reefs that drop abruptly off into the deep blue and the walls are a banquet of colorful sponges, huge basket corals and a myriad of sea fans and gorgonians. When it comes to fish life, think BIG. Big schools of jacks and barracudas, turtles and sharks are quite common. Time your visit around the new or full moon and Manta rays are almost a given. Hammerheads, Leopard and Guitar sharks and White tips sleeping in the cracks and crevices as well as huge tunas patrol the walls. Basterra is infamous for the dreaded El Presidente, a downward current that washes off the reef top . " "Barracudas and Jacks in thousands surrounded with grey reef and white tips sharks, turtles and a occasional manta "
"Moalboal is an overlooked and not crowded dive place with Pescador Island 40 min from the little fishing town and The Cathedral is an awesome dive ca 40m try it out, cheap and relaxed. " "I've done about 40+ dives at Moalboal and you can't go wrong. You'll see your turtles (every day), sea snakes, white tip sharks and whale sharks, I saw three and one swam next to the boat right along the edge of the wall about 1-2 metres down. Moalboal is great for crustaceans and nudibranchs as well. One small point as for the resort, it's very small and not the most hygienic place, but the locals are great." Pair of Gobies on Whip Coral in Cebu, Photo credit: Graham Collins. "I recently spent a week visiting Cebu, which was time and money well spent. I inadvertently timed my travel to Moalboal in mid-January, allowing myself a few days to check out the fish and coral at Pescador Island and the Panagsama Beach house reef. However, the highlight of the visit was more on dry land, the area being a backpacker haven, with a fan-cooled room (outside bathroom) at Mollie's Place costing me 100 pesos (US$ 2) a night. The food, however, was superb. I feasted on the freshest fish and superdense homebaked Swiss-German wheat bread and omelettes at giveaway prices. As luck would have it, I caught the Sinulog parade in Cebu City (third Sunday of January) and the charge of the Mardi Gras atmosphere was unparalleled. Also, where in the world can you get 25-peso (US 50 cents) fresh mango shakes and enjoy a complete a la carte dinner for 4 for merely 500 pesos. Pssssst....Cebu is where the action's at! Forget Manila and Boracay, the latter being overrated anyway. " "Moalboal: Deep wall with whalesharks, sharks, turtles and many other species, also close to Pescador Island for some of the best diving in the world." "I have made about 30 dives in Moalboal Cebu, and 4 in/near Malapasqua, Cebu. I don't think there have really been hammerheads or whale sharks at Moalboal for a long time, though you will spot a couple of small sharks and an eagle ray that buzzes house reef / the wall. The wall is the easiest and best shore diving you could ask for (well, if there's a storm, which is rare, do watch the tides to plan a comfortable entry and exit). There are tons of lionfish at Pescador, good soft coral and black coral. Sunken island is a real standout, despite the sometimes ripping current. (two sherbet-colored, meatloaf-sized spanish dancers...wonderful large sponges with sealife in them...rocks with eels...and other nice surprises.) 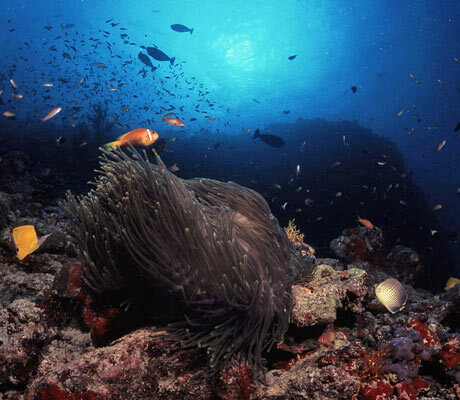 There are more types of corals, anemones, sea fans, gorgonians, etc. than you can count. 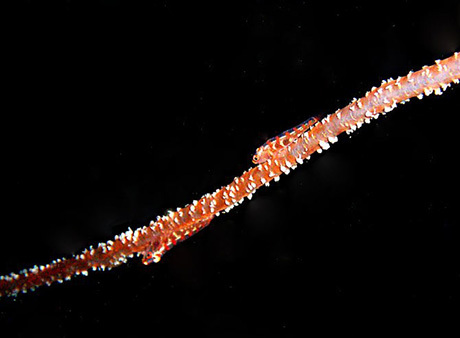 One year there were a lot of salps and venus' girdles; these are drifters, but Moalboal caught a huge "crop." Malapascua really does have thresher sharks; even in really bad chop, one came in, when the dive center said there would likely be none. As of 4 or 5 years ago, Malapascua was definitely more primitive for the money, and the water is brackish. However, I've seen things there (boat dives, in or near the sanctuary) that I couldn't identify even with a very good guidebook; huge variety of nudis. Moalboal has (or had) in theory, a clean drinking water system (the local expats drank it) but it was compromised a few years ago, leading to some severe illnesses. So don't let the more cosmopolitan aura trick you into eating or drinking carelessly. The drive between Moalboal and Malapascua is scenic, though long. The public water-taxi (boat shuttle) from the Cebu mainland to Malapascua is a small open boat that rides low in the water, especially when some of the occupants are big westerners with SCUBA gear." "Moal Boal was definatly worth visiting. Not just great diving but fantastic snorkeling as well!" " Just got back from Moalboal, Cebu. The diving is great, however, the rest of the trip was less than stellar. Moalboal is a huge reef with wall diving galore. Plenty to see. Dives are $20 +/- a few dollars depending on the dive shop and whether or not you pay cash. Nothing to do in Moalboal when the diving is over. Prices are a little more expensive than I expected but that can be explained by the locals driving up the prices in order to stick it to the tourists as much as possible. The nearest ATM is in Carcar which is a 1.5 hour bus from Moalboal back towards Cebu city. Allied bank next to a Jolibee restaurant on the corner. Your best bet for shopping might be here too. Getting there? From Cebu airport take a taxi to "South Bus Terminal" and use the meter (about 150 Peso). Bus to Moalboal is 2.5 hours and only 89 Peso. On my way out I caught an economy bus back to Cebu for only 49 Peso ($1.25 US) at about 5:30pm. Have fun. Hope this helps." "Moalboal House Reef. In front of Mollie's Place Garden, Excellent for snorkling, it has steep drop offs of 30 meters. I only went diving for 18 meters. It has beautiful marine life and many colorful corals. Pescador. Pescador has the best Marine life and there are alot of varieties of different kinds of fish. White beach. Snorkeling is a great sport to do at White beach and you can play volleyball with your family and friends on the beach. You can also enjoy barbecues and do karaoke. Just pack your sunblock lotion wherever you go." "Just got back from Cebu in Philippines, diving at Moalboal, down the south west coast of Cebu � June 2007 � low/rainy season in Philippines. The diving was a little better than I�d come to expect from the Philippines. The diving is mainly wall dives down to over 50 metres, with the shallows being fringing reefs close to shore. All dive sites are 10-15 minutes boat ride only. The coral health at dive sites such as Tongo Sanctuary was excellent, and the coral colours and diversity at White Beach was second to none. Pescador Island is supposedly the flagship dive site, with stronger currents, the chance of seeing pelagics, and a very nice cavern. Whale sharks supposedly make regular appearances here too. However, when I dive there were more fishing boats than fish. Indeed, how can one expect to see big fish action or large quantities of fish, when there are twenty fishing boats sharing a dive site the size of a rocky outcrop? The fish life was the disappointing aspect to diving here. The largest fish one regularly encounters is a parrotfish (no, not a bumphead, but a normal sized one!). This I have come to expect from diving in the Philippines, where the sheer weight of human numbers and fishermen, means that the seas are raped down to their limits at all times. Still, I must say that the coral life does make up for the lack of fish to some degree. The locals are trying to change the habits of their culture and have declared two sanctuaries where fishing is prohibited � Tongo and Ronda Sanctuaries � I have never seen smaller marine sanctuaries in the whole of my life (max 100 metres long), so it is unlikely that this initiative will make any difference at all. Still, a step in the right direction, I suppose. I dived with Neptune Divers and they proved to be pretty average. As for Moalboal itself, well apart from the many dive centres, there is an adventure centre which offers river climbing, kloofing (canyoning), mountain biking, horse riding etc. They seemed a reasonable outfit and the trip was good fun, but again don�t expect the same safety standards � there were no lifejackets provided for the river nor safety helmets � something that would be illegal in most developed and many developing countries. There is no beach in the central shore area at Moalboal. The only beach is at White Beach, a kilometre to the north. This looked quite nice when viewed from the dive boat, but I do not know anything about the accommodation there. I stayed at Cabana in the centre, which was US$ 50 per night. It has okay seaviews, and cable TV with air-con, shared pool, no internet - an okay resort, if a little overpriced by SE Asian standards. During my visit in low season, there was perhaps twenty �western� divers in town. Apparently in high season it gets very busy and there are several music / pool bars to hang around at. The dining at Moalboal was surprisingly good. After gotten used to the appalling menu choices, and cooking abilities at all other places that I have visited in Philippines, it was a pleasant surprise to find a restaurant that in Indian, Thai and Indonesian cooking, including vegetarian and vegan options. Too many times have I left restaurants in the Philippines, totally disgusted by the American-inspired junk food menu options, and atrocious chef abilities. This is one of the biggest reasons for not travelling to Philippines, along with the pollution, smog, incessant noise and filth from overpopulated islands. Moalboal has these too. Overall, I�d say that if you are planning a trip to the Philippines and diving in Cebu, Moalboal is worth visiting. However, if you are looking for a quiet piece of untouched beach paradise, go to another country." "Pescador Island (Cebu) is very good,and the 60 m deep wall that runs 3-5 km from Moalboal and south to Santander (where you cross to Negros if you want to dive Apu Island) is different every day. " Read two articles on diving Malapascua: getting there, where to stay, what to expect, and so on. Meanwhile, below are the dive descriptions. "As well as the famous thresher sharks, Malapascua has pretty good macro life too with frogfish, lots of seahorses, anemone shrimps, porcelain crabs, pipefish etc, and a muck dive with robust ghost pipefish, flamboyant cuttlefish, blue-ringed octopus, baby cuttlefish, red octopus, and many mandarinfish"
"The best dive sites ever! Beautiful mandarinfish on twilightdive, threshersharks and mantas at Monad Shoal, hammerheads and whitetips at Gato Island ! It truly was AMAZING!" East Garden is a marine reserve, depth around 12 m. There much macro life including small crustaceans living on sponges and corals. Monad Shoal is one of Malapascua's unique dive sites This sea mount is about half the size of Malapascua itself. The top plateau lies between 15-23 m. On each side is a vertical drop-off. If you get there early in the morning you may well see Thresher sharks being cleaned around the edge of the plateau. Look out also for Devil rays around to watch and, in April, the Manta rays. "The main reason that divers visit Malapascua is to see their famous thresher sharks on Monad Shoal (season all year round, but best time of day is early morning). I dived their twice and was lucky both times, with manta rays showing up there too. The visibility was not great at 15 m so photo opportunities were limited, but the encounter is well worth it." Gato Island is also a marine reserve and is a limestone rock. It is famous for the numbers of sea snakes in the water around it. Normally divers go half way around the island and get picked up at the other side, allowing a full tour in two dives. 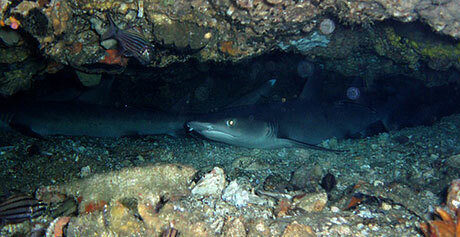 You may see white-tip reef sharks resting in the caves which are all around the island. White tip reef sharks, Photo credit: Graham Collins. "The area's most famous dive site is Gato Island, which is a sea snake sanctuary, complete with white tip sharks and a cave and tunnel or two. Pretty much all the diving is close to the tourist area and the water temp is 30C, so it's comfortable diving all round." Kemod Shoal is a similar shoal to Monad shoal, but smaller in size and further away. You can sometimes see hammerhead sharks here. You have to arrive very early and dive down to around 30 m in the blue. 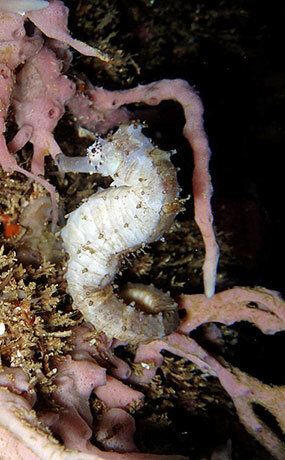 Highlights of North Point include pigmy seahorses and frog fish. Pantaw-Pantaw is good for macro diving - frog fish, octopus, nudibranchs, shrimp and tiny crabs. Timok Island (depth 12 m) is excellent for nudibranch spotting. "Beautiful Bohol, famous for the Tarsier Monkeys and Chocolate Hills also boasts several premier dive sites. Resorts and Dive Centers line Alona beach on Panglao Island and diveboats head out to Balicasag Island everyday at 8 or 9 am. The steep coral covered slopes and walls of it's protected waters contain schools of Barracudas and Jacks, banner and butterfly fishes, batfish and the smaller nudibranchs and flatworms and numerous varieties of anemones with their resident clownfishes. 2 other popular sites are Cervera Shoals and Pamilacan Island. The former is also locally known as snake island because of the numerous large banded seasnakes that inhabit the reef bottom. Sweeping currents in the area also bring in the larger fishes like Barracudas and jacks although the bottom itself is pretty bare. The chance to see Turtles, Bumphead Parrotfish and humphead wrasses are what divers go to Pamilacan for. It's healthy reefs are a photographers delight with both soft and hard corals providing shelter to a profusion of reef fishes. Closer to Alona Beach, the dive sites are coral rich slopes that drop off to a wall that extend past 40 meters. Arco Pt or Hole in the Wall , where one can pass through a small hole on top and exit mid reef is also the fish feeding area where friendly damselfishes and Sergeant majors swim up to meet the divers. Gorgonians, fan and tree corals as well as the beautiful dendronephtya soft corals are common sights along the slopes and walls. Surgeon fish and small Tunas cruise along at mid-depth." "If I was going to say my favourite dive site, based on one visit, as a diver, then I'd have to say anywhere along the wall off Cabilao Island, Bohol Province, in the Philippines. The colours were just indescribable. " " The best in the Alona area. Has some walls and clearer viz than sites closer to Alona Beach. There are a number of dive sites in the Alona area, along the south shore of Panglao Island. Nothing great but not bad. This was my second trip to Philippines for diving; I have enjoyed both. Nothing terribly exciting, but interesting and enjoyable. The diving and the general environment are very relaxed. Prices are great. Don't expect to see any fish larger than 50 cm on most dives - I think they've all been eaten. On the other hand, lots of nudibranchs and anemonae fish." "Non divers and divers alike flock to the island of Boracay, postcard perfect beach, emerald waters of the sea provide what is called the best scuba classroom in theworld. Dive operators line the beach and offer courses in English, German, Japanese, Korean, French, Spanish and Hebrew. Non-Filipinos who come to visit usually plan to visit a few days but end up staying a month or two. A proliferation of restaurants and bars guarantee a healthy nightlife. Providing big fish action is a divesite called Yapak, a blue water descent to the reef top at 25 meters, it is not for beginners when the currents are strong. Barracudas, jacks and sharks can be found here. Further out are Black Rock, Buruanga and Maniguin Island, locations that provide similar environments, slopes of hard and soft coral with the accompanying reef dwellers." "A little known dive site between Boracay and Apo Reef. There are no markers, no indication that there is anything there, you are simply in the middle of the sea. The reason for this is because there is nothing there, and you are in the open sea. This dive is only reachable on a Dive Safari from Boracay to Apo, it is however worth it. In the intial drop to 30 metres (no reference-you are blue water diving), you will descend through Devil rays, Mantas, and sharks. Once at the bottom there is a ledge that drops to oblivion, be careful for the vicious currents. There is no coral, no fans, just rock....but if you want Pelagics, this is where you want to be. As this area is the meeting place of the Sulu and South China Sea, the currents attract anything that is over 5 feet long. You will see, Tigers, Great Hammerheads (schools of), Large Reef Sharks, Oceanic Bulls, Blue and Yellow Fin Tuna, and so much more. If you are really lucky will also see Whale Sharks. It is a mystery as to why this place attracts so much wildlife, but it does, and makes for an overwhelming, incredible dive. Dive shops in Boracay know where it is, you need to talk to them to see it!! " " Where else can you reliably dive with thresher sharks on a daily basis"
There are many dive sites around the island offering encounters with turtles such as the olive ridley, a variety of nudibranchs, reef sharks, eagle rays are often spotted, a variety of lionfishes, scorpion fish, many types of tropical reef fishes, and many types of shrimps, to name a few. The area also has very healthy corals and have beautiful bottom formations. Other beaches have great muck-diving . " "Top dive sites in Leyte Island includes Liloan, Limasawa Island, Malitbog, Padre Burgos, Panaon Islands and Tangkaan Point. There are a lot of fish sanctuaries in Leyte Island. Nice coral formations, big fish such as whale sharks and thresher sharks are often seen with turtles, manta rays and colorful soft corals. Currents are slightly stronger as the island is near Pacific Ocean. Panaon Islands is a must see for divers. Just don't touch the whale sharks in Padre Burgos but you can swim with them. " "Napantao in Leyte has fantastic coral and is hardly dived. A pristine spot off the beaten track. " " Similar to Tubbataha reef "
"New dive attraction has to be seen - first in the Phiippines"
Best Time to dive. March to September for Camiguin, Year round for Davao. Climate: Average Daily Temp 28-32 C , cooler from December to February. Water Temp: 26-27 C from Dec. to March and 28-29 C during the rest of the year. "The waters around Misamis Oriental and Camiguin hide spectacular reefs filled with soft and hard corals. A prevalent feature of Camiguin diving is the presence of large numbers of black coral trees. Medina Paradise is a famous dive site due to the lush soft corals divers encounter. Off shore, Burias Shoal and Jigdup Reef have walls and current swept reefs as well as the big fish schools. Mantangale Alibuag Dive Resort's Again reef was so named because of guests' inevitable request to dive it again and again. " "Davao City folks consider the Davao Gulf as their aquatic playground. The Pearl Farm Resort boasts of 2 WWII era shipwrecks within a stones throw of some of their guest cottages. Big Ligid Island as well as Aundanao Sanctaury not only has spectacular walls and underwater topography, they also get frequent pelagic visitors aside from a healthy fish population. " "Frontier diving, a lot of variety of fish and corals. Still unexploited nature at its best!" Don't let the title put you off, most of the creatures you see in neighbouring Malaysia are also in the Philippines. Excellent for fish identification in the Philippines. These links will take you to the Agoda site which offers discounts on hotels in the Philippines. If you have more information about diving the Philippines we'd love to hear from you. Send us your comments below or fill in our more detailed review form.